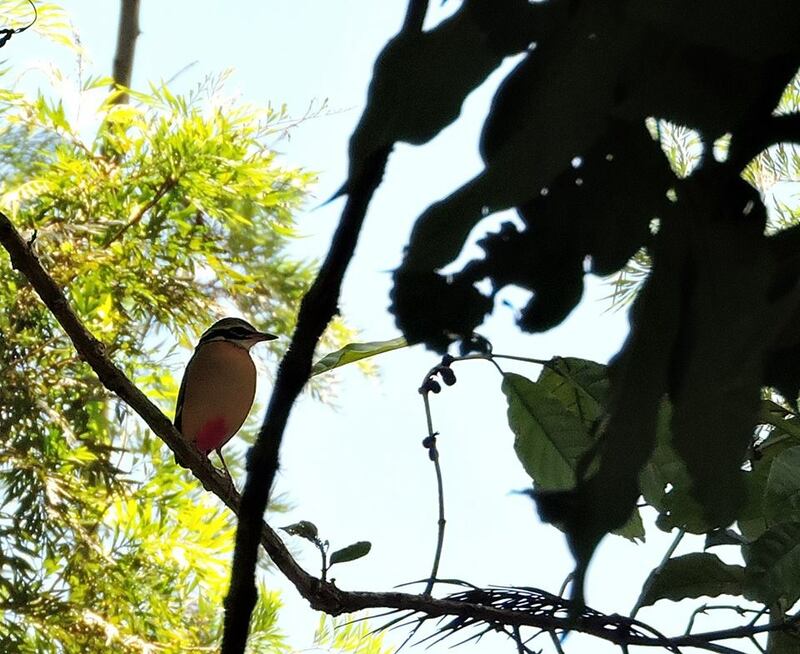 While in Thekkady earlier this year, I had spotted a stubby bird I had never seen before. I was taking an evening stroll behind the cottage. And there she was, like a doodle crayoned by a prodigiously-gifted child, about 100 meters away from me. She looked incredibly familiar. But I just couldn’t put my finger on it. I took a few photographs of her, as the sun went down, and returned to the cottage. I pulled out my copy of “Birds of the Indian Subcontinent” by Richard Grimmett, Carol Inskipp and Tim Inskipp to find out her name. This book is more than just a field guide. We share a “honey, I’m home” kind of relationship. I have spent many endless nights with the book on my couch. While traveling I go through it only after I am done with my quota of birding for the day. It turned out that I have been so enamored with the contents of the book that I have never bothered to notice the bird on its front cover page – The Indian Pitta. 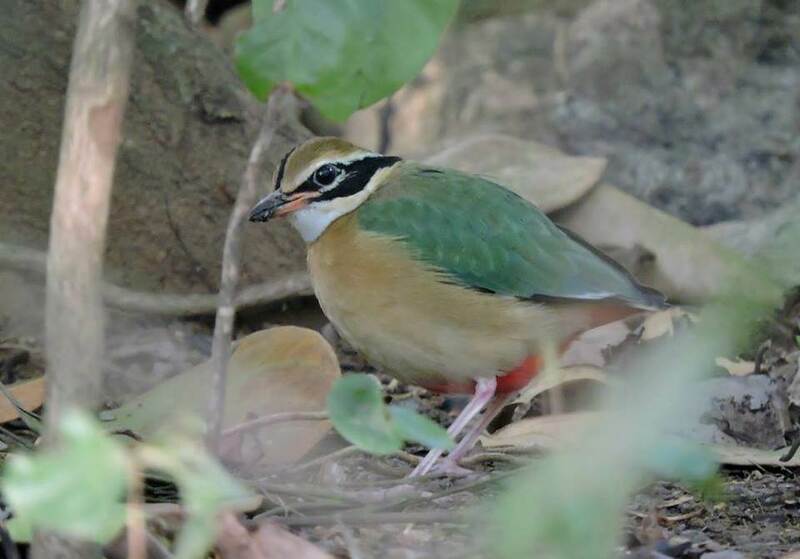 The Indian Pitta is a passerine bird found all over the Indian subcontinent, forming a superspecies with three other birds – the Fairy Pitta, the Mangrove Pitta and the Blue-Winged Pitta. She looks like a crayon box with stubby legs and a short bill. The upper region of her body is bathed in parrot-green, and the lower parts – doused in the hues of orange. Her tail feathers are smudged in bright red and blue. And her black coronal stripes give her an air of mischievousness, like a cat-burglar in search of insects. I haven’t spotted the Indian Pitta since. But I am pretty sure that I will remember her name the next time I see her. thanks comrade. glad you felt it! this. love this. this this this. Amazing shots & nice words. I am inspired to try Verse herder style. Will try & dedicate that poem to your unique style. 🙂 Good wishes. if frogs somehow evolved into birds; this would be it. Good One. Pitta’s are passage migrants. You can ever record their calls and songs early morning . Which is why they are also called 6 o Clock bird in Tamil. I don’t think they are passage migrants in South India especially in Kerala where you saw the bird . But in some parts of India like in Nagpur , Kolkata and in Mumbai they enjoy the status of Passage Migrant. So when I got my first shot of a Pitta in my city I was ecstatic. Thanks again for these lovely tidbits comrade. Six O clock bird sounds so cute! Happy birding to you too. What a beautiful bird! I can see why you like her. Vultures?! Woaw you are lucky comrade. I have never seen one. You’ve never seen a vulture?? On googling, I hear they’re a pretty rare sight, but I’ve had someone tell me, “Those big (somewhat scary) birds we see in the sky? Yeah, they’re vultures.” So, I’m assuming I’ve seen vultures. 😀 Not that up close, but yeah.